Last night, the Marlins traded every player on their active roster with a 2013 salary greater than $1.6 million, save for Ricky Nolasco, who’s owed $11.5 million next season. And Nolasco may be gone soon, too. The Marlins’ latest fire sale came less than a year after Miami signed free agents Jose Reyes, Mark Buehrle, and Heath Bell to great fanfare, as the team prepared to christen the new, publicly-financed Marlins Ballpark. Now, all those players are gone. Reyes and Buerhle were traded last night to the Blue Jays, along with starter Josh Johnson, outfielder Emilio Bonifacio, and catcher John Buck. Bell was sent to the Diamondbacks in late October. When the Marlins open their second season in the new ballpark, fans will see Giancarlo Stanton in right field and a lot of unknown young players scattered around the diamond. Tuesday’s trade was just the latest purge by Marlins’ owner Jeffrey Loria, after the latest spending binge, after the prior purge. Loria’s pattern is well-known and has landed him in hot water occasionally, although not nearly as frequently — or as hot — as his critics demand. One such critic is the players’ union. The Major League Baseball Players Association complained for years that the Marlins violated the league’s revenue-sharing plan by using the money received under the plan for everything but improving the product on the field, as is required. Between 2002 and 2010, the Marlins reportedly received close to $300 million in revenue sharing. With the threat of a formal grievance, the Players Association forced an agreement from the Marlins to use all revenue-sharing proceeds on player development and salaries for three seasons. The agreement was announced in January 2010 and now, three seasons later, has expired. Imagine that. Even with their taxpayer-funded ballpark, the Marlins will almost certainly be on the receiving end of revenue sharing for the foreseeable future. The club doesn’t have the fan base, television contracts or corporate sponsors bigger-market teams enjoy. And after the sell-off to Toronto, the fan base is likely to shrink even more. We don’t know how much the Marlins will receive in revenue sharing going forward, but we do how that figure will be determined. It’s all spelled out in the Collective Bargaining Agreement the players and owners signed off on last November. With the Marlins’ financial dealings on the hot seat — again — it’s as good a time as any to dive into complex details of MLB’s revenue-sharing plan. First, a few definitions. Clubs start with gross revenue, which is all revenue generated by the team’s baseball operations (ticket sales, concessions, local television contracts, etc. ), plus a 1/30th share of MLB-generated central revenue (national television contracts, MLB.tv, licensing and merchandise, the All-Star Game, etc.). Clubs then subtract ballpark expenses and the 1/30th share of central revenue. What’s left is “Net Local Revenue.” In an unusual twist, the CBA set the Marlins’ Net Local Revenue at $100 million for the 2012 revenue-sharing year. No other team was singled out in that fashion. The revenue sharing plan has two building blocks: the base plan and the supplemental plan. Let’s start with the base plan. All 30 clubs contribute 34% of their Net Local Revenue to the base plan pool. The base plan pool is then distributed equally to the 30 clubs. Some teams, like the Yankees and Red Sox, contribute significantly more to the base plan pool than they receive, and are known as Revenue Sharing Payor Clubs. Others, like the Rays and the Pirates, receive more than they contribute, and are known as Revenue Sharing Payee Clubs. The supplemental plan is trickier. The goal of the supplemental plan is to raise the overall percentage of revenue shared by the Payor Clubs from 34% (in the base plan) to 48%. But each Payor Club contributes a different amount to the supplemental plan, based on something called a Performance Factor. Here’s how it works. The Net Local Revenue of each club is added together and then multiplied by .48 (for 48%). The result is the “Net Transfer Value” for the revenue-sharing year. We know the Net Transfer Value of the base plan is 34% of total Net Local Revenue. That means the Net Transfer Value of the supplemental plan is 14% of total Net Local Revenue. The question is how to generate the 14%. That’s where the Performance Factors come in. This chart details the Performance Factor for each club in 2012 and 2013. The clubs with positive Performance Factors contribute to the supplemental plan in an amount equal to the Net Transfer Value of the supplemental plan multiplied by the club’s Performance Factor. The clubs receiving funds get an amount equal to the Net Transfer Value of the supplemental plan multiplied by the club’s Performance Factor. So, for example, if the Net Transfer Value of the supplemental plan for 2012 was $50 million, the Yankees would contribute $13.85 million and the Marlins would receive $3.9 million. This flowchart captures the base plan and supplemental plan I just described. The base plan is on the left. Beginning with the 2013 revenue-sharing year, “big-market clubs” will forfeit a percentage of their net revenue-sharing proceeds; 25% will be forfeited in 2013, 50% forfeited in 2014, 75% forfeited in 2015, and 100% forfeited in 2016. The “big-market clubs” are the Yankees, Red Sox, Mets, Dodgers, Angels, Cubs, White Sox, Giants, Blue Jays, Phillies, Nationals, Braves, Rangers and Astros, plus the A’s, but only when (and if) they are in a new ballpark. Where do the forfeited funds go? Well, mostly back to the same clubs. Sort of. 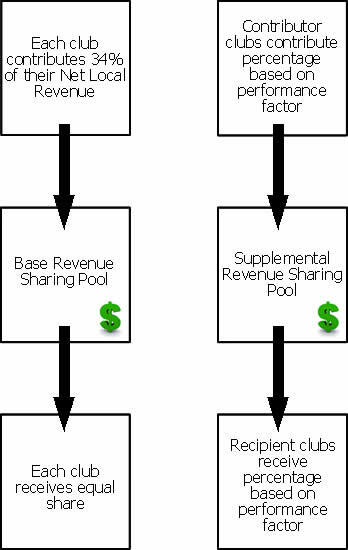 The forfeited proceeds go to the Net Revenue-Sharing Payor Clubs (those teams that pay more to the base and supplemental plans than they receive) in proportion to how much each club contributed to the Net Transfer Value. This provision brings the Performance Factors back into play. Note that the Blue Jays, Braves, and Nationals have negative Performance Factors but are considered “big-market clubs.” Conversely, the Twins, Mariners and Cardinals have positive Performance Factors but are not considered “big-market clubs.” The end result? The Blue Jays, Braves, and Nationals must forfeit their revenue-sharing proceeds but, to the extent any is a Net Revenue-Sharing Payee Club, that team will not receive any forfeited proceeds. At the same time, the Twins, Mariners and Cardinals need not forfeit any revenue-sharing proceeds, but may, if they are Net Revenue-Sharing Payors, receive a percentage of forfeited funds. There’s one more twist, and it involves the luxury tax (which I explained last Friday in this post). A team that exceeds the luxury tax threshold for at least two consecutive years forfeits a percentage of the refund it would otherwise receive as a big-market club. A luxury tax offender for two years forfeits 25% of the refund; a three-year offender forfeits 50% of the refund; a four-year offender forfeits 75% of the refund; and a five-year offender forfeits the entire refund. For now, the Yankees are the only five-year offender. Keep in mind, though, that the Yankees have a plan to get under the luxury tax threshold by the 2014 season. As I explained in my luxury tax post, the Yankees want to take advantage of the CBA provision that would re-set their luxury tax rate to 17.5% in the 2015 season if they kept their payroll under $189 million in 2014. Now it’s clear there’s an additional benefit to avoiding the luxury tax in 2014. By 2015, the Yankees would again receive the Net Revenue-Sharing Payor Club refund from the proceeds forfeited by the “big-market clubs.” And given that Yankees have the largest Performance Factor, that refund is likely to be significant — perhaps more so than the luxury tax savings. A principal objective of the Revenue Sharing Plan is to promote the growth of the Game and the industry on an individual Club and on an aggregate basis. Accordingly, each Club shall use its revenue sharing receipts . . . in an effort to improve its performance on the field. The CBA specifically prohibits clubs from using revenue-sharing receipts to service debt obligations unrelated to baseball operations; make payments to individuals other than on-field personnel and those in player development; make payments to entities not involved in improving on-field performance; make distributions to team owners. The commissioner may impose a penalty on any team that violates this provision (although that has never happened, to our knowledge). And the players’ union may pursue a grievance against any club that violates this provision. Indeed, it was the threat of such a grievance that led the Marlins to agree to do exactly with the CBA requires back in January 2010. We can expect the union to keep a very close eye on the Marlins in the wake of the sell-off to the Blue Jays. All clubs contribute 34% of Net Local Revenue to the base plan, which is then distributed back to the clubs in equal shares. High-performing clubs contribute an additional percentage of Net Local Revenue to the supplemental plan. The percentage is determined by the club’s Performance Factor. Low-performing clubs receive an additional percentage from Net Local Revenue from the supplemental plan. The percentage is also determined by the club’s Performance Factor. Beginning in 2013, big-market teams will forfeit an increasing percentage of revenue-sharing proceeds. The forfeited funds will be shared among the high-performing teams, in proportion to their Performance Factors. Any high-performing team that would other receive a refund forfeits an increasing percentage of that refund if it exceeds the luxury tax threshold for two consecutive years, or more. We hoped you liked reading The Marlins and the MLB Revenue Sharing System by Wendy Thurm! Great post. No secret Loria has been cheating for years and hopefully this will FINALLY throw enough bad PR towards him that Selig is forced to address the issue head on, hopefully by forcing Loria out of baseball. Even that would allow Loria to win as his sale of the team with a new stadium would give him exorbitant amounts of money. If Loria goes, he wins. If Loria stays, we lose. He’s going to get his money regardless so it might as well be outside baseball instead of driving all baseball fans crazy.